​Are you ready to finally write your book and get it out into the world? This is a unique, high-level and personalized mentorship. It is an extraordinary, supported process that will get you to create, plan, write and COMPLETE your book as you join a community of writers from all over the world - together we will travel this exciting journey. This is our first level mentorship, and it is a very tightly-held course that holds you to your promise to write your book. We set the targets and deadlines and show you how to write with clear focus and intent. This is the first step all writers must take down the path to publication. We work intimately with writers over the entire first draft process. Over and above structured lessons via emails, you get LIVE mentorship calls, a closed accountability group and one-on-one sessions with your writing mentor. That means you get to see our faces and really become part of a small group that is going to start, and more importantly finish, together. The small and personal nature of this is why we have close to 100 published authors come through our mentorships - and that is pretty remarkable. This will prompt, push and hold you to your promise to write your book. We have limited spaces for each mentorship because of the high level of support we offer. An initial installment is payable on acceptance. Why is this mentorship so successful? Sarah has fifteen years of getting writers to produce the most publishable version of their books and selling these to publishers. She is a literary agent and editor and really will support you to write your book. Kate is on her 4th book and is an international author, speaker and brand expert. She will lovingly hold you accountable to your OWN promise to make this dream a reality. This is truly a remarkable, hand-held process that will get your book out there and start to walk you down the road to getting your book published. This mentorship is honestly a massive juggernaut. Once we start, you are going to be coached, cajoled, loved and pushed to get to the end of your book. We would like to take you all the way to publication with our more advanced mentorship, but we can chat about that later. Nothing happens without your first draft completed! We start with a live call explaining the process and a lesson in how to write a book, what publishers are looking for and how to begin to structure your thoughts into a contents list. In the second week, we will stream writers into fiction and non-fiction depending on your chosen genre. The core of the communication happens via structured email lessons you will receive twice a week. Novelists will be on a fast-track to plot, plan and write and will receive an email instruction every day to get your plot points adequate and your words flowing. There are monthly live video conference calls on book structure, plotting and technique. These also form the backbone of support, as writing can be a very lonely journey. Each writer has four personal sessions. The two with Sarah will work directly on your book structure, positioning, plot, and concept. One will happen early in the course to get your book on the right track from the start. The others will happen later to resolve and refine the book. The sessions with Kate will cover target-setting, emotional and confidence blocks, how to move forward and set accountability challenges. The second session will be a focused look at your author brand and how to build and leverage this. During the first four months, the entire focus will be on your word count and getting your draft down (aka writing your book). Sarah Bullen is an international writing coach and author who has worked with over 2,000 writers since 2005. She runs international writing retreats and workshops and works with writers and publishers all over the world to help them find and tell their best story - in any format. Sarah has written six books and writes for magazines internationally. She is a regular guest on talk shows and a keynote speaker at writing workshops internationally and does one-on-one writing coaching. Sarah’s clients are based all over the world and she runs courses and retreats in the UK, US, Greece, Ireland and South Africa. Kate Emmerson - known as THE QUICK SHIFT DEVA shares her enLIGHTening ideas of LIVE LIGHT LIVE LARGE around the globe. She a global clutter expert, sought after international speaker, professional lifestyle coach, mentorship facilitator for writers and runs retreats and masterminds in idyllic locations, including Greece, Rome, Dubai, USA and South Africa. She has 3 books published. She was interviewed in an award winning film, “The Secrets of the Keys”, alongside the world’s self development leaders Brian Tracy, Johan Assaraf and Don Miguel Ruiz. ​“When I wrote my first book, I literally had a green light from my publisher from a 2 page proposal that I submitted, and had zero input from specialists of any kind - just a deadline to hand it in. I literally sat and wrote on my own, but I am naturally massively disciplined and can simply trust my own process when I have big deadlines, plus I have the personal skills to overcome any negative self-talk that gets in the way of most writers. Writing my second book was a whole lot harder! I know this process is not that easy for most of you. My role is to keep you on track and to get your book out of you! I am very firm.. but kind." These are the real day-to-day nudges to keep you writing, keep you inspired and most importantly help you over writing slumps. Professional industry experts that give you insight on writing and publishing. BOOK STRUCTURE: This is both a course and a mentorship and Sarah is a structure fanatic who will show you that a strong structure is the gift that sets your writing free. Kate is all about supporting you to stay confident and release any "stuff" that niggles its way into your brain or heart, so you get on with the job of writing! Dealing with EMOTIONS of writing, procrastination or overwhelm that will kick you to touch if you don’t know how to handle it. Publishers will share expertise on traditional publishing and what makes a successful book work. What is editing books all about? How the editing process works with top international editor Sean Fraser. How much time do I need to put aside for this? This mentorship works around your current life. We are not expecting you to quit your job. We do like you to be on the live calls once a month but other than that you are going to have to work out how much writing time will get your book completed. For some writers it’s a slow and steady hour a day, others may find they block-book a series of weekends away to get up the word count. You will also need to update on the Facebook group every week and take approx 20 minutes to support your fellow writers. Note: it is this community of support that past authors swear by, as a way to keep going! Is this for novels or non-fiction? Ah, good question! That makes my heart sing as it shows you know already where your book is heading. You understand genre. The answer is BOTH novels, and non-fiction writers can apply. Novel writers will be on a fast-track process to plot, outline and write the book. Memoir and non-fiction writers will be on an equally fast course to finish, but with their own lessons. Each writer gets TWO sessions with both Kate and Sarah. These are 45 mins each. Sarah's includes 45 mins of reading time with each session. Most of the feedback is structural, with a focus to getting you to write a publishable book with refinements to structure, plotting, characters, and story arc. The opportunity to get focused reading time with feedback happens in month five when your first draft will be sent to a professional editor for appraisal (not editing). Not at this point during this mentorship. This is the first step on the road to publication. Sarah does take on certain books to edit, but you first have to finish your book. ... most often your first, second and third draft before it is ready for an edit. Can I do this if I am already published and want to write a 2nd book? Of course. We have some writers who had done this three years in a row. Can Sarah take on my book as an agent? This is not part of the mentorship. Sarah's does take on some of our graduates but this is not part of this process and taking part does not imply she can place your book. Submissions to an agent will happen separately and independently of this course, after the PITCH TO PUBLISHED BOOTCAMP. What if I don't finish my book in the allotted time? Hmmm, we like to think you will, and experience has shown us that you can, and most likely will. If you don't finish, however, the chances are you will be a LOT further along than before we started! We would like you to complete and will do our best to make sure you do. What if LIFE gets in the way and I need to stop the mentorship? The fee is non-refundable. However, you will continue to receive all the lessons and recordings of live calls, and still be able to use your personal coaching sessions with Kate and Sarah within the 6-month mentorship. When life eases up, you can pick up your book where you left off and continue with your lessons. Often writers take us up on the highly subsidized “re-sit” fee to come and enjoy the group support and weekly deadlines to get back on track again FAST! We want you on the group, on the calls and engaged with us and your book so that you go all the way. I LOVED everything. The structure and the accountability. I loved the combination of Kate's inspiration and Sarah's taskmaster writing challenges. I loved hearing other people's progress and stories – it inspired me to carry on. Also was great as a forum to discuss some of the structural aspects of writing and really narrowing the focus of your book's core. The one-on-one sessions were brilliant as it really kept me believing I could do it and gave me good ideas to implement going forward. For someone who wants to do it but isn’t sure how or if they have it in them, this is the perfect way to test yourself. I have challenged myself to test a dream. I loved it. This mentorship is extremely supportive & well structured so one is not left in the wilderness and wondering what to do or write next”. The weekly tasks are very well thought through and keep one on track and it’s wonderful to connect with other writers. It is a non-judgmental course and process and therefore you can explore your writing without fear. through this process again with them. To turn your dreams into reality one needs to take action. This helps you to do just that. It gets the words moving from your head onto paper and your book becomes a reality. Sarah and Kate’s writing mentorship is the stick of dynamite you need to stop gazing at your own navel and instead gaze at a finish line that gets steadily closer. If you’ve been struggling to get your ideas out of your head and onto the page, this mentorship will prove invaluable. “I never knew how to share my story, and then like a divine gift from the universe, came Kate and Sarah. From book structure and editing to publishing, branding and PR I did it! And if I can, you can. What an incredible experience – let them show you how. It’s a life-changing journey. What an amazing and inspiring experience it has been. After sitting for years with bits and pieces of my second book done, I now have a completed first draft in my hands. D-Day – Wow! What a journey. Yes I have a first draft! 89 000 words! 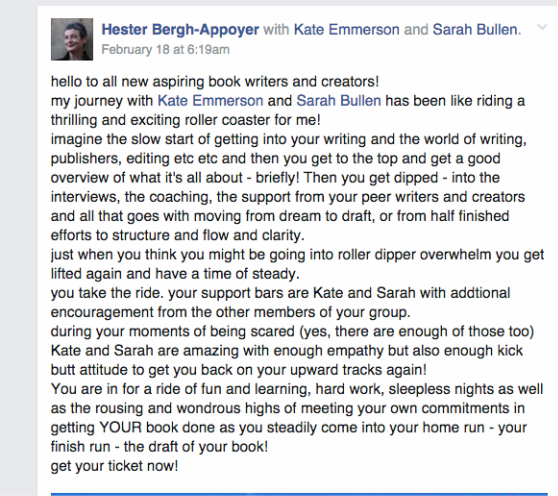 I absolutely loved the process with Kate Emmerson and Sarah Bullen. Not having been an author before, the experience gave me the grounding I needed to complete three chapters for a co-authored book and get started on my first book. “Anyone who feels they have a book buried inside should be part of this course to dig deep and uncover the book that needs to be written”. This has started me on a journey that I dreamed of from an early age but hadn’t felt confident enough to act on. The whole process of writing and publishing has been de-mystified and made ever so do-able. It is no longer an intimidating out of reach dream, finishing my book is now an attainable goal. "I want to thank you for putting together this course material, the course itself and without a doubt, for the magnificent support, inspiration, nurturing, friendship and confidence that both you Kate, and you Sarah have afforded us during this ‘a journey into the unknown world of writers’. This has been one of the best things to have happened to me for a long time! There is no doubt that I attract fabulous people into my life. Bravo! " This group has started me on a journey that I dreamed of from an early age but hadn’t felt confident enough to act on. The whole process of writing and publishing has been de-mystified and made ever so do-able. It is no longer an intimidating out of reach dream, finishing my book is now an attainable goal. This course was a big eye opener for me! It showed me that I can definitely write and publish a book, and that it’s also not an exercise for the faint of heart! However, with the Mastermind structure it’s much more accessible that just doing it in the dark… having the guidance, expertise, and intense delivery context is definitely a potential game changer. Hester Bergh Appoyer - Being Nice isn't Enough! Kate and Sarah will help you up on your feet and moving in the right direction. They are kind, but clear; wise, but pragmatic. I recommend this to anyone who is ready to take their writing dream and turn it into a reality! I want to tell aspiring writers that it's actually easier than they think - to write, that is. And that a course like this, with a deadline and access to writers and industry professionals is worth every penny! The people, the community that was formed, the honesty and vulnerability and the opportunity we had to share stories, realizing that it wasn’t just us, we weren’t alone, sharing celebrations. What really worked was the commitment to the regular posts and you holding that firmly; the consistency was epic.